As to the Xenomorph itself (possibly the nastiest individual to garner an occult following since…ever) it is said that the creatures in the film will be “large and in charge”, the result of a cross between the classic Xeno and the “Space Jockey”, the much wondered about GI-NORMOUS alien being found dead in the derelict ship of the first film. This seems to infer a certain amount of the plot which will be in keeping with the fundamental nature of the Alien reproductive cycle. 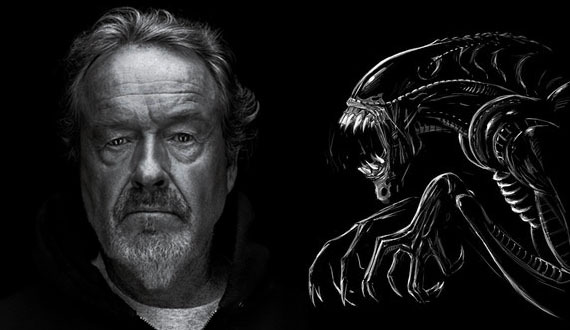 How closely Ridley Scott et. al. will follow the tenants and characteristics of the original series remains to be seen. In my humble opinion, he would do well to stick closely to the details, even if he wishes to change the basic plot design and make a break from the series. He’s sort of dug in a whole, as though the film is no longer considered a prequel, that’s what it was initially billed as and that’s what fans expect and want to see. I feel much the way about this that I feel about a band that loses its lead singer but insists on keeping the band name. You can’t pick and choose which elements to keep and which toss when you’re playing around with a “pop-cultural staple.” In the end, I can only speak for myself, but I think were he to deviate too much from the established coda of the original series, having already inferred an inherent similarity by the very presence of the Xenomorph as an antagonist, the net result would be some very disappointed fans. This entry was posted in Entertainment Corner, JustBlog Entries and tagged Alien, director, film, horror, movies, Prometheus, Ridley Scott, science fiction, Space Jockey, Xenomorph. Bookmark the permalink.